meet the challenges of 21st century. 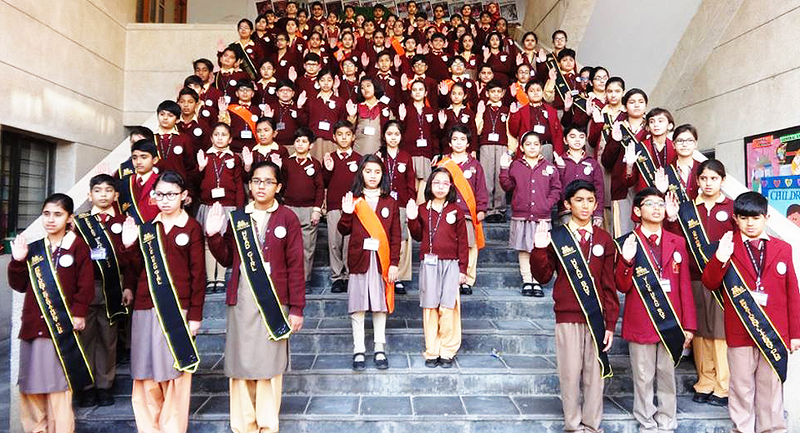 Keeping in mind the changing paradigm of education today, Roots in a first of its kind initiative has customized Primary Curriculum setting Cambridge International Primary Programme as a benchmark. RIPP is benchmarked with the Cambridge International Primary Programme which comes from one of the World's leading assessment organizations. RIPP is a holistic effort towards achieving a sustainable curriculum which meets the local as well as global educational needs. In continuation of our rich history of engaging students in world class learning and providing them enriching experiences, RIPP has been developed through indigenous effort by our seasoned and experienced curriculum reformers and developers. Our primary programme encompasses 21st century skills-critical thinking, communication, collaboration and creativity promoting Knowledge, skills and values through RSS 3 Es; exposure, expansion and exploration. Designed for children aged 5-11, RIPP provides learning objectives for each year of your child's education. Its step by step programme of learning takes children from the start of primary education to completion, before they move on to secondary education. The RIPP helps school teachers and parents gain a greater understanding of their children's abilities. Continuous assessments of learning objectives are integrated in the curriculum. These assessments provide information to analyse students' achievements, strengths and weaknesses, and give teachers invaluable information to help guide the child in the following year. In the final year of primary education i.e Grade 5, students take the formal examination in all subjects to evaluate their knowledge and application skills. Moreover, RIPP is a comprehensive primary programme preparing students to be active participants in a lifelong journey of learning. It provides opportunities for students to build meaning and refine understanding, principally through structured inquiry. These are essentially social acts of communication and collaboration. It focuses on the development of the whole child as an inquirer, in the class room and in the world outside. It is defined by trans-disciplinary themes of global significance, explored using knowledge and skills derived from subject areas with a powerful emphasis on inquiry-based learning. The syllabus of RIPP English enables students to achieve greater fluency, accuracy and confidence in the language as it is spoken and written. English is a gateway to all the other subjects. Roots International Primary Programme’s base line is to develop all the four skills of the pupil i.e. Listening, Speaking, Reading and Writing. Islamic values are inculcated in the young minds. Kalmas and Namaz are an integral part of our curriculum. Roots International Primary Programme cultivates strong moral values according to Islam. Honesty, truthfulness, tolerance, fair play, justice, respect, responsibility, courage and care for humanity are the cornerstone of our curriculum. All religious events are celebrated with tremendous fervour and enthusiasm by students in the school. Through historical stories we inculcate compassion and patriotism in our students. Urdu is our national language and is introduced alongside English in the montessori school. Strong foundation is laid in the early years by developing urdu reading skills using phonics approch and colourful readers are introduced to arouse interest and imagination of the young learners. All the four language skills listening, speaking, reading and writing are developed in harmony. In the primary years children read story books to enhance their reading skills and develop hand writing script by practicing writing in the work books. Comprehension skills are developed gradually by the proficient Urdu subject teachers. 1st initiative at Elementary Level in the WORLD by Roots and Intel. Launch of Smart Brain Program at Roots - Discover Your Child's Hidden Talents!